Can Mast Cell Tumors be Cured? These tumors do respond very well to modern therapy, by using a combination of surgery or chemotherapy (sometimes radiation) along with immunomodulation therapy such as K-9 Immunity™. 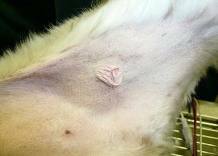 In fact, this type of cancer has one of the best outcomes of any canine cancer. Lets look at what Mast Cell Tumors are, how they form and the different treatment options available today. 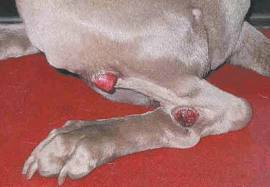 What Is Mast Cell Tumor? Mast Cells are a special type of cell, which are involved in immune function and found primarily in the skin (although they are also found throughout the body). 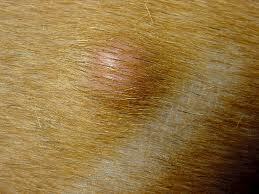 They make up about 20% of the skin cells in a dog, and are responsible for allergy response, among other things. When the body is exposed to particular types of harmful substances, the mast cells release chemical called histamine, which causes the typical allergy-like response. They also produce other vital chemicals which the body needs to survive, called cytokines. Even though mast cells are primarily a type of immune cell, they can become cancerous. Cancer is first and foremost an immune dysfunction disease. Tumors form when the body fails to recognize as invaders the cells that have multiplied improperly. In the last few years specialized compounds have become available for use in cancer patients to try and correct this error. These are called immune modulators. These immune modulator compounds often trigger the patient’s “immune recognition response” allowing the body to recognize and destroy the aberrant cells. When this recognition response is triggered, the body re-learns how to deal with the tumor cells as it would with any other wound, and destroys those aberrant cells, producing healthy scar tissue in their place. These immune modulators are different than the class of drugs called Chemotherapy. Chemotherapy drugs are toxic, and work by destroying the cancer cells directly. Chemotherapy drugs are very useful in combating canine cancer, in that they reduce the number of cancer cells present, but they do not address the underlying cause that allowed the cancer in the first place. Immune modulator compounds on the other hand are not toxic. They are a class of compounds called heteropolysaccharides, which are naturally occurring in our foods and are required in all mammals for triggering normal immune function. For some reason, in cancer patients large amounts of these immune modulators are required to trigger that normal rejection response, which in turn kills off the cancer cells. Historically, surgery has been the first line treatment for mast cell tumors. This is usually a very good option, depending on where the tumor is located, how extensively it has spread and whether any major organs or underlying structures are involved. After surgery, some type of chemotherapy drug is usually recommended to clean up any remaining cancer cell not removed by the surgery. Chemotherapy and surgery are both effective in removing the bulk of the tumors, but should be seen as only one arm of a multi-pronged approach. This is because we all know that surgery and chemotherapy do not cure cancer. The underlying cause of the cancer is still there, which is the immune dysfunction that allowed the tumor to form in the first place. Chemo and surgery do not deal with this underlying immune dysfunction. However, when chemo and surgery are used along with immune modulation therapy (such as K-9 Immunity™, and immune proteins, such as K9 Transfer Factor™), the chances of a dog overcoming mast cell cancer and surviving a normal life span are excellent. Ultimately, it is only the patient’s own immune system which can overcome the cancer. Until and unless the immune recognition response is triggered, the patient cannot overcome the cancer. That is why many Vets will tell you that the dog’s life can only be extended, but that the cancer is still present. While this was certainly true in the past, modern research into immune modulation therapy as an adjunct to conventional therapy has proved this to be no longer true. Cancer can be cured. 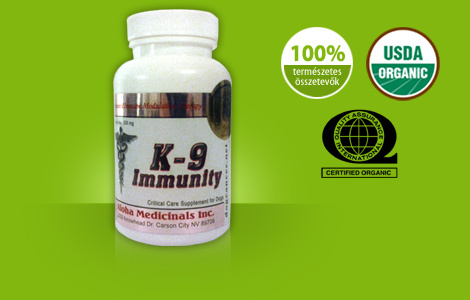 K-9 Immunity™ is a veterinary grade formula specifically intended for use in dogs fighting cancer, to trigger the proper immune response. This is really the only question that matters. How well any dog will respond to therapy is difficult to generalize. Treatment success depends on many factors, such as the dog’s age, his or her diet, their medical history, where the tumor is located and how extensive it is and what major systems are involved. 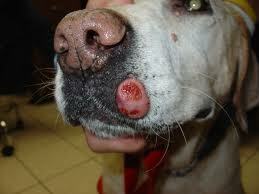 Generally speaking, the earlier a mast cell tumor is diagnosed, the better the outcome will be. Since most mast cell tumors occur on or just below the skin, when they are found early, and surgically removed, immune modulation therapy (such as K-9 Immunity™), and immune proteins (such as K9 Transfer Factor™) usually assures that the dog is cured and the tumor does not recur. Cancer is the leading cause of death in American dogs. It is thought by many experts that diet is the main reason for this. We feed our dogs a diet based mostly on grain, even though none of the dog family feeds on grain in the wild. Not the wolves, or coyotes, or dingoes, or hyenas, none of them. Dogs have not evolved the necessary enzymes to digest or utilize grain in their diet. They are primarily carnivores. When you feed a carnivore a diet based on grain, they develop various immune dysfunctions, including cancer. If it is diet that causes cancer in the first place, it seems pretty obvious that diet is an important part in treating a dog with cancer. In fact, diet is one of the most important factors in a successful treatment of mast cell tumors! To give the dog the best possible chance of overcoming this challenge, the proper nutrients must be fed. Don’t make the mistake of thinking just because a dog food is expensive. or because it is recommended by the vet or has a fancy name, that it is necessarily the best option for your cancer patient. There are some good recommendations for dog cancer diets found on the Dog Cancer Diet link.